The idea for this dish just literally popped into my head one day. I was just sitting there and I thought of pulled chicken and cornbread. And what's better than combining the two into one? The chicken is cooked in a crock pot to make it super tender and full of BBQ-y goodness and the muffins are baked then stuffed with the chicken mixture. This is a great meal that's pretty quick and covers all the bases for a great weeknight dinner when served with some veggies. It's the perfect little bite that kids and grown-ups alike will love! • Make the BBQ sauce the day before. • Mix the dry cornbread muffin ingredients together in the morning and add the wet ingredients right before you bake them. 1. Mix sauce ingredients together and pour over frozen chicken in the crock pot. 3. 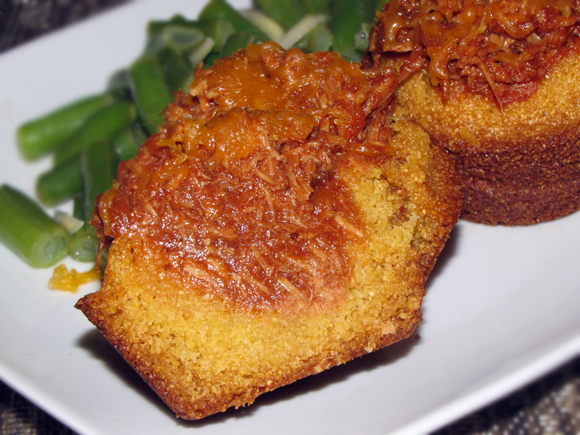 Shred chicken with two forks and stuff into cornbread muffins using method below. 2. 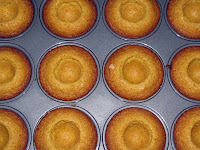 Whisk all ingredients together and pour evenly into 12-count non-stick muffin pan coated with non-stick spray. 3. Cook for 5 minutes then reduce oven temperature to 375 and cook for another 10 minutes or until muffins are golden brown and toothpick inserted in center comes out clean. 4. 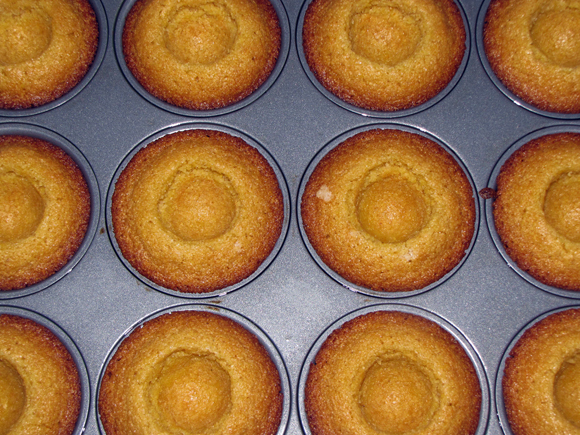 With the muffins still in the pan, make a well in the center of each that is 1" - 1.5" wide and about 1.5" deep. You can use the back of a spoon or grab the pestle from your mortar and pestle set if you have one and push it into the muffin gently. 5. 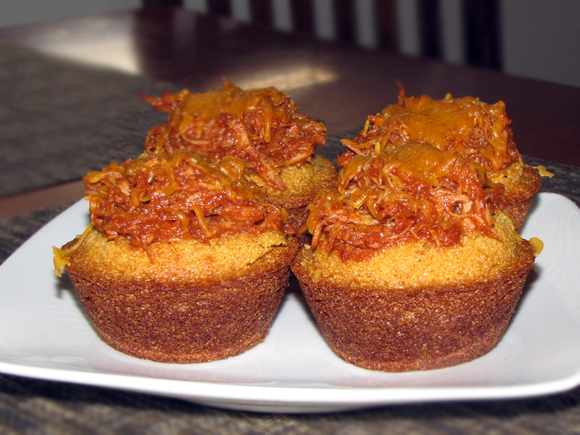 Fill each hole with some of the shredded chicken creating a mound on each muffin. 6. Sprinkle a little shredded cheddar cheese if you'd like then stick them back in the oven for 2-3 minutes or until the cheese is melted and the chicken mixture is hot.